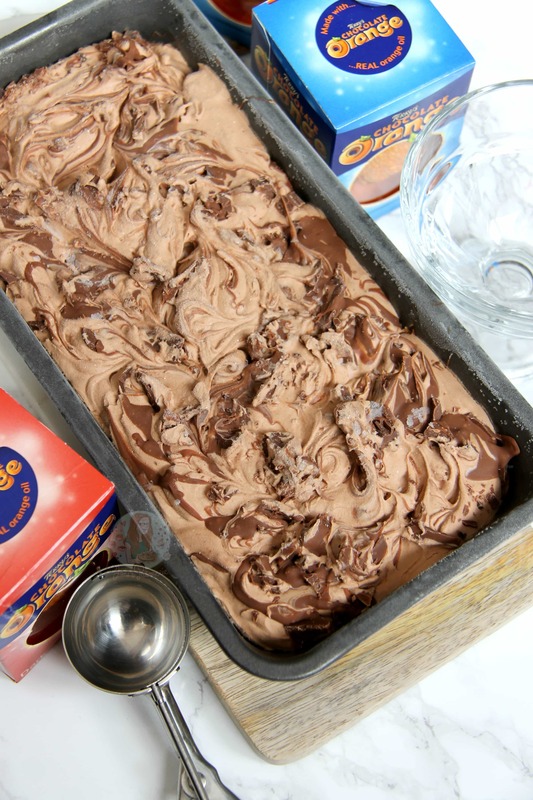 Terry’s Chocolate Orange Ice Cream! 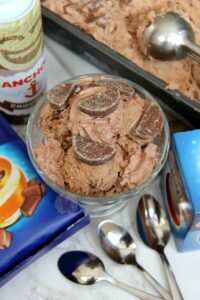 Easy THREE INGREDIENT Terry’s Chocolate Orange Ice Cream. No-Churn, Delicious, Ridiculously Easy to make. So, I got bored one day… I had some Terry’s Chocolate Oranges to use up that had mysteriously made their way to the back of the pile and only had a week left on their Best Before Date, so I made ICE CREAM. 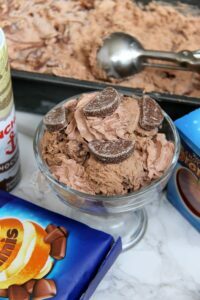 I went for a No-Churn recipe for this one, because I wanted to be quick, and I know how much you all love these recipes. 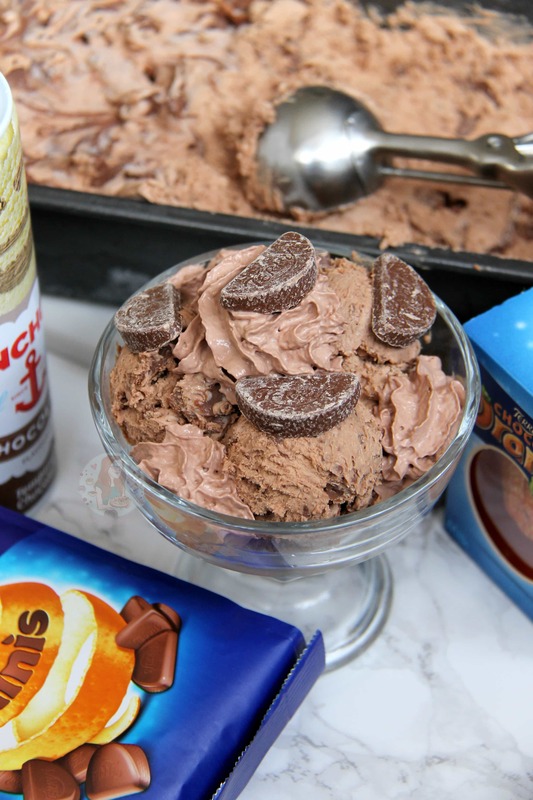 It is only April, but you can make these Ice-Creams in 10 minutes, and then have it freezing. After its frozen, you can make it SO easily into a Milkshake, by adding some Milk, and any decorations your fancy. If you wanted to, you could have the Milkshake and one of my Terry’s Chocolate Orange Cookies on the side. So I can’t cope with how unbelievably amazing this tastes. 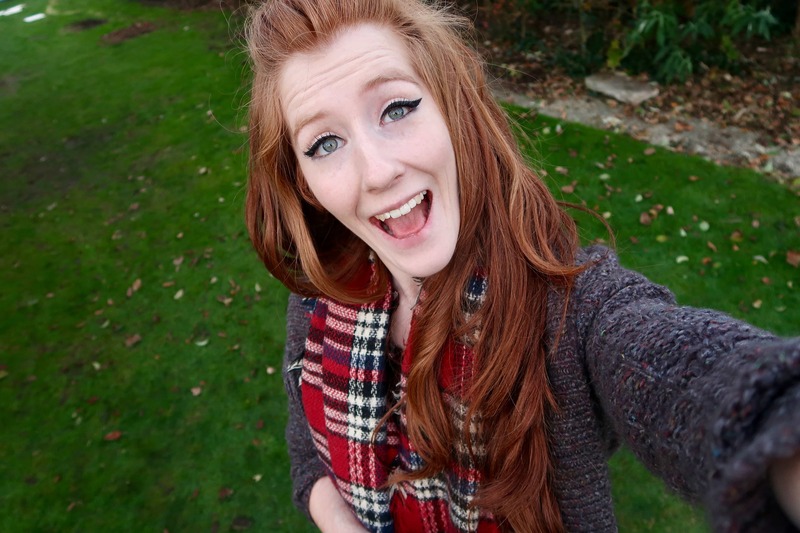 Like honestly, I can’t cope. Can’t Cope. 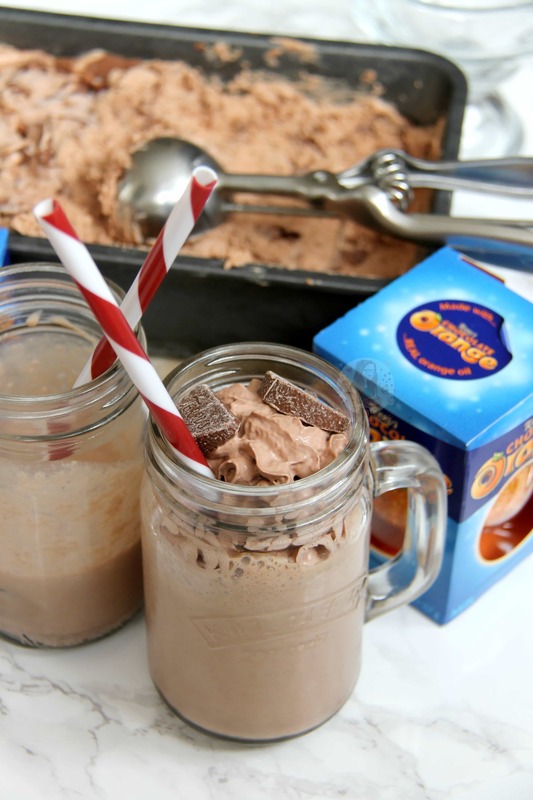 I made it really easy by just using Condensed Milk, Double Cream, and the melted Terry’s Chocolate Orange. It’s so easy to melt the chocolate, and add the Cream and Condensed Milk, and just whip it till its thick and mousse like. 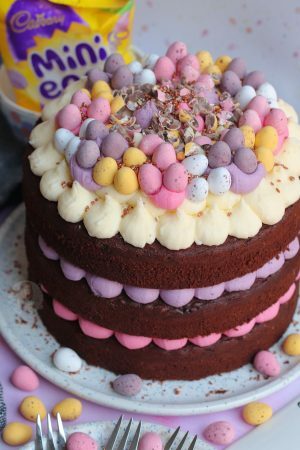 Like I mentioned in my Creme Egg Mousses the other week, you can easily make this mixture just into a Chocolate Mousse. 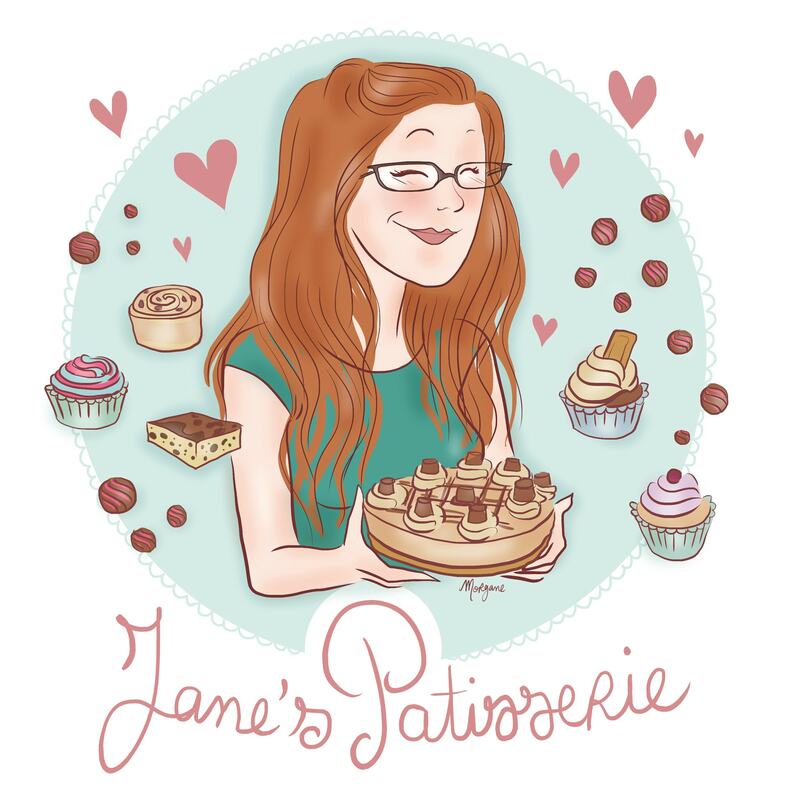 Which, I have… and honestly, I ate several of them myself as I just adored the flavour. 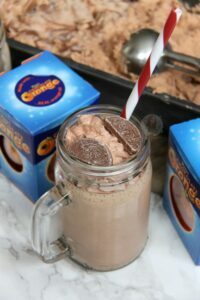 Chop the two Terry’s Chocolate Oranges up into small chunks and melt carefully in the microwave, or in a large glass bowl over a pan of simmering water. Pour the Melted Chocolate, Cream, and Condensed Milk into your mixing bowl and whisk until a thick mousse like texture is formed, and it holds itself – this can take up to 5 minutes! If you wanted, chop up half of another Terry’s and melt the other half. 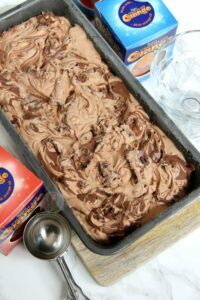 Gradually spoon in the ice cream into a loaf tin, or freezer proof container. and sprinkle with the chopped terry’s pieces. Drizzle over the melted Terry’s and swirl through the mixture. Freeze for 6-8 hours or preferably overnight so it has time to get to the correct texture and it is easier to serve! When serving, ideally remove from the freezer 30 minutes before you want it! Get three scoops of the Ice-Cream and put it into a blender/smooth maker. Add 200-250ml of the milk, and blend the mixture till its smooth. Pour into your favourite glass, and swirl on some Chocolate Whipped Cream and even more Terry’s! I am using Terry’s Chocolate Orange here, and I used one Dark and one Milk one for the Ice Cream mixture. 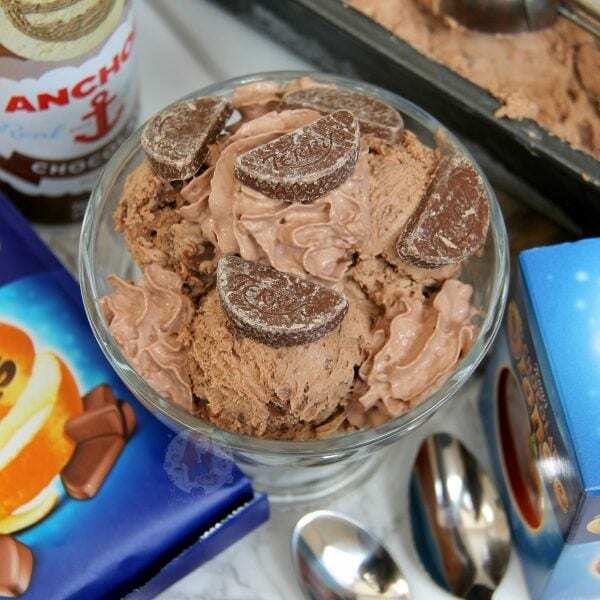 You can use Cadburys Chocolate, Lindt Chocolate, or anything you wanted, but I LOVE Terry’s soooo! The cream should stay as double cream otherwise it might not work, so please don’t use Single Cream. If you are in a country without double cream than use the highest fat one you can find such as whipping cream or heavy cream! 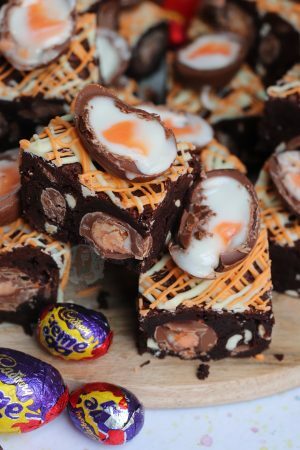 Find my other Chocolate Orange Recipes on my Recipes Page! Older Next post: No-Bake Double Decker Cheesecake! Newer Previous post: Twix Cupcakes! This looks fantastic, cant wait to go out and buy some Terrys Chocolate Orange to try this! 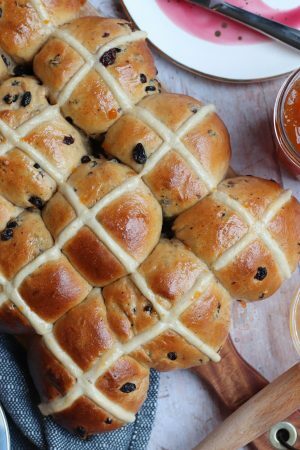 Its always such a treat when one of your recipes comes in!